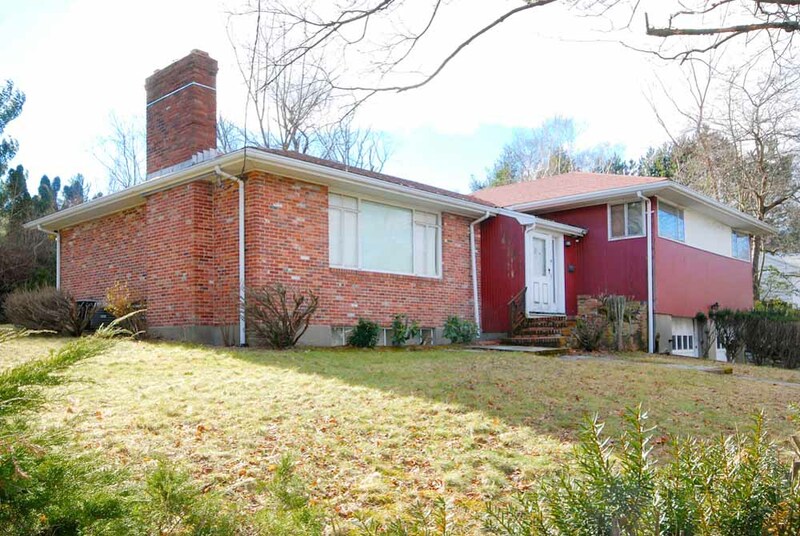 Thanks to reader Beth, who spotted this wonderful 1956 split level time capsule house for sale in Newton, Mass., and posted the tip over on our Retro Renovation Facebook page (just hit 27,000 Friends, woot!) The listing agent Eric Glassoff confirms that indeed, this house has been with just one owner, for whom it was custom built. Looking at the interior design, I think that there was some redecoration in the late 1960s or early 1970s — all that lovely chinoiserie and metallic wallpaper. 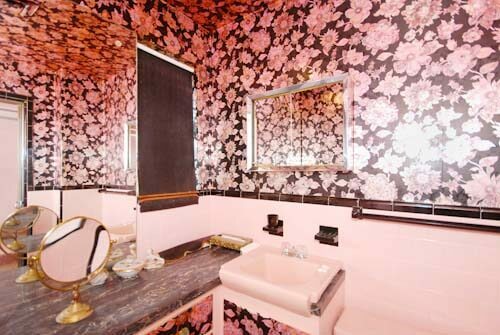 I could be wrong, though — this could just be a very fashion forward 1956 house. 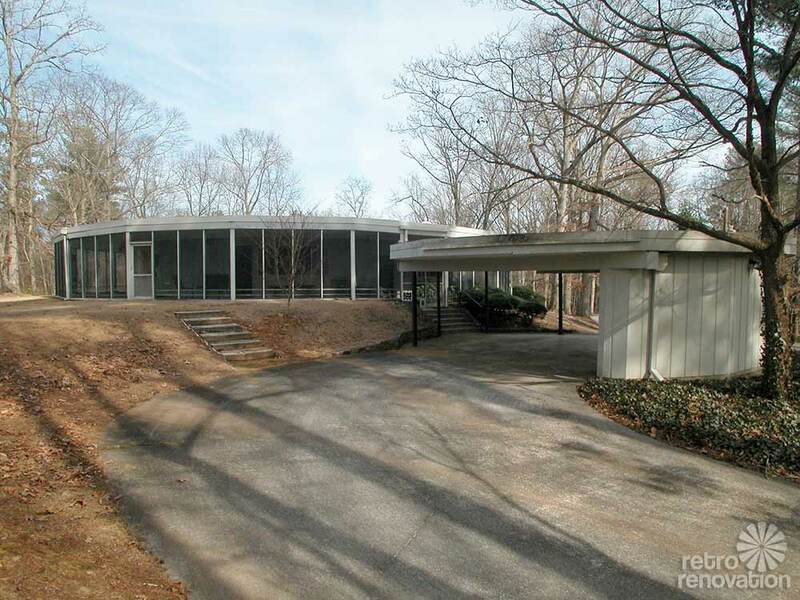 Thanks to agent Eric Glassoff for permission to showcase this listing and to photographer David Ward of the The Creative Ward for permission to feature his photos here. 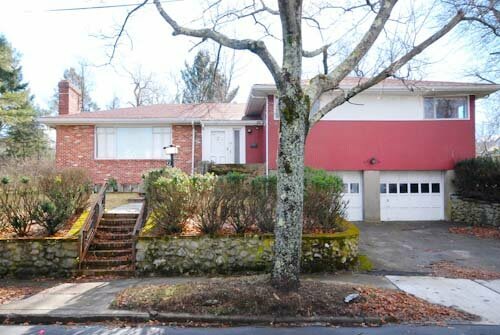 A split level house is considered a variation on the ranch house. 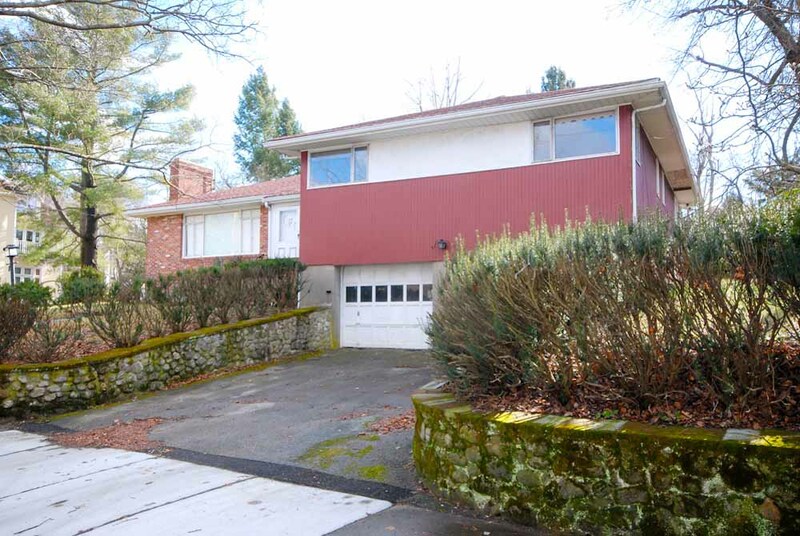 I tend to associate split level houses with the 1960s and 1970s. But, yes, they were around in 1956 — this one proves it. This is a very handsome house — great curb appeal. I love all the stone retaining walls and the mature shrubbery. 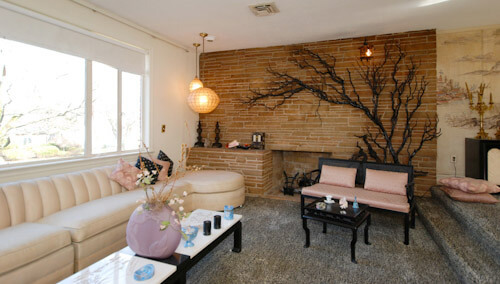 Let’s head into the living room — simply stunning. …and my goodness, what is the espaliered tree thingie? Woah. In a good way. This lamp is terrific. 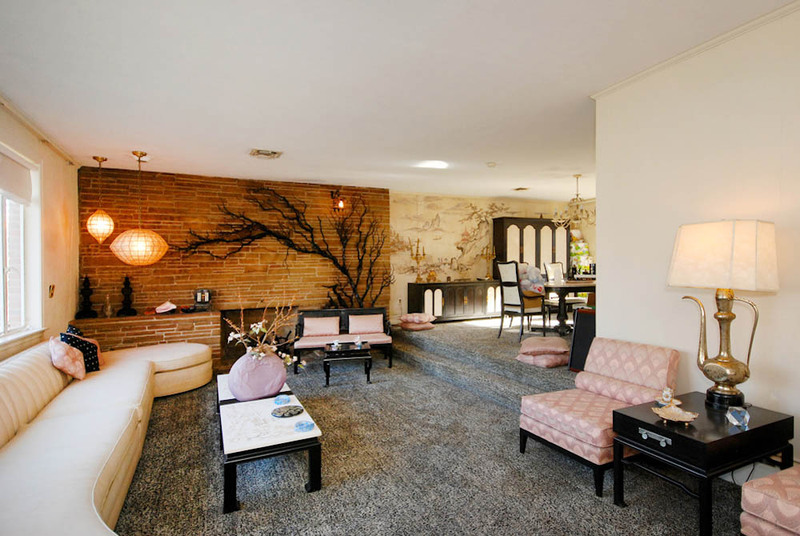 Golly, so many adjectives that all basically say, “Wow!” Much of furniture design, I’d call chinoiserie — a style I associate with the 1960s. Furniture like this — with its original lacquer finish — is pretty collectible, I’d say. 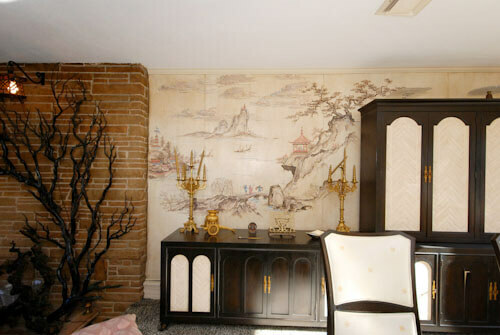 Chinoiserie is also a style I’d call “timeless,” because you see it used in so many eras. 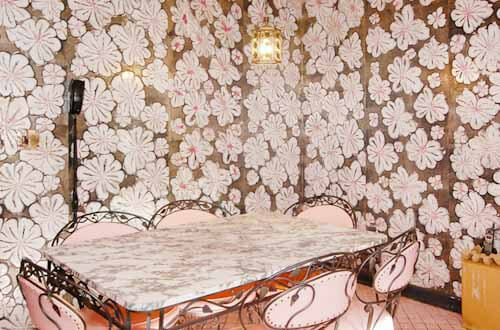 The wallpaper mural also speaks to the Orient. *Adore*. A very pretty chandelier. 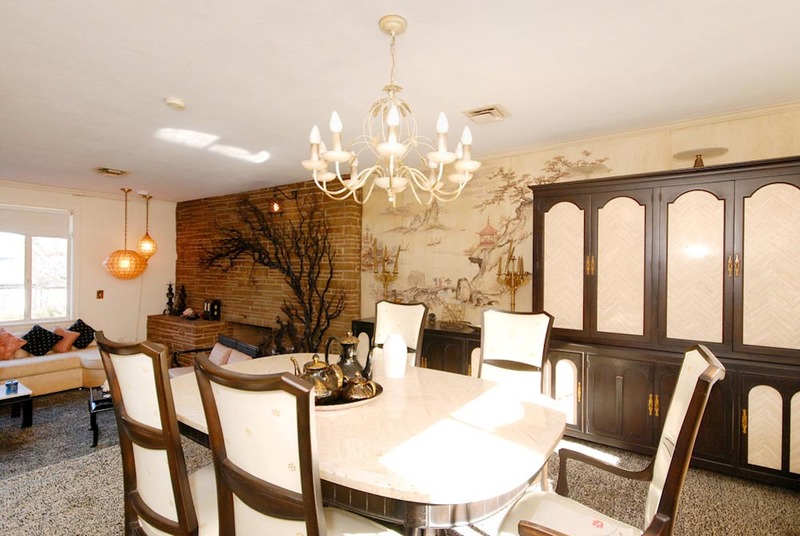 Toleware, I’d say… almost a “birdcage chandelier,” but not quite. 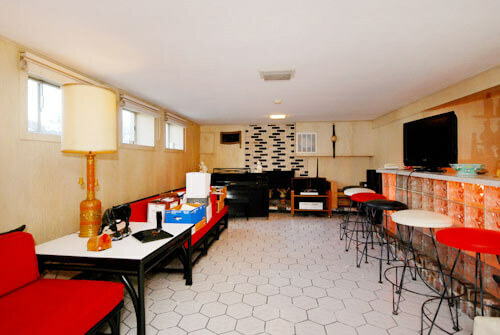 Hold on to your eyeballs, here’s the kitchen. The cabinets look to be laminate veneer. 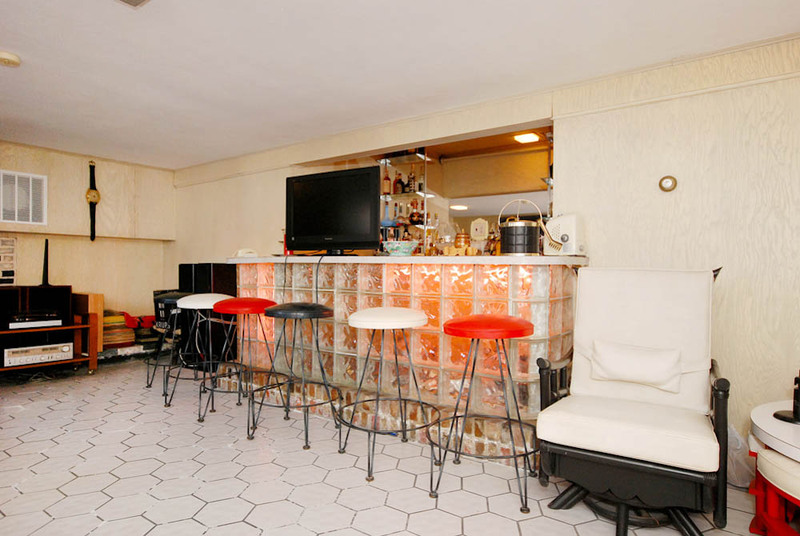 All the appliances — they must be original, though, don’t you think? 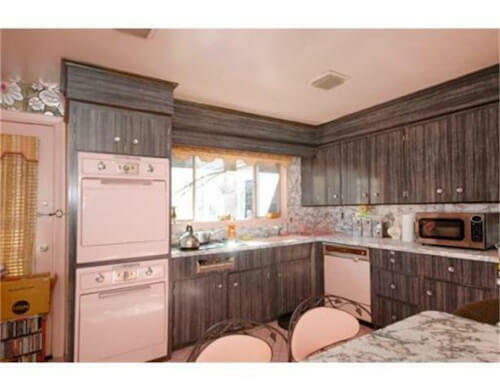 This photo makes me think — original kitchen. Patrick, can you date the appliances?? Foil wallpaper to coordinate. Yum. Yum. Yum. 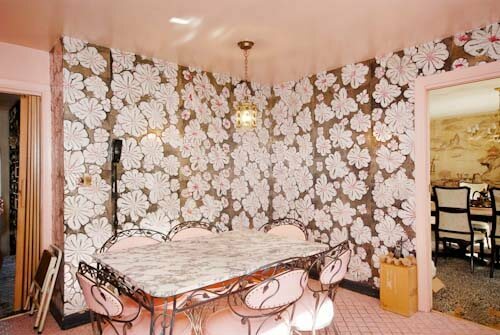 I zoomed in to try and capture the pink foil wallpaper loveliness. More pink. 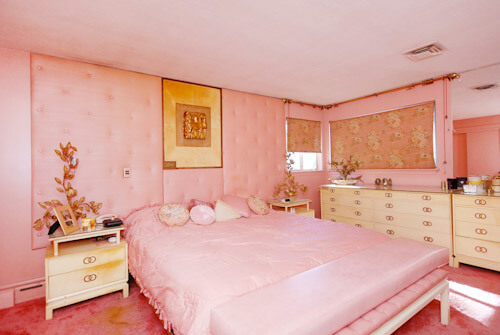 This color scheme makes me think this room’s decor is original to 1956 — which was right at the height of pink-love. 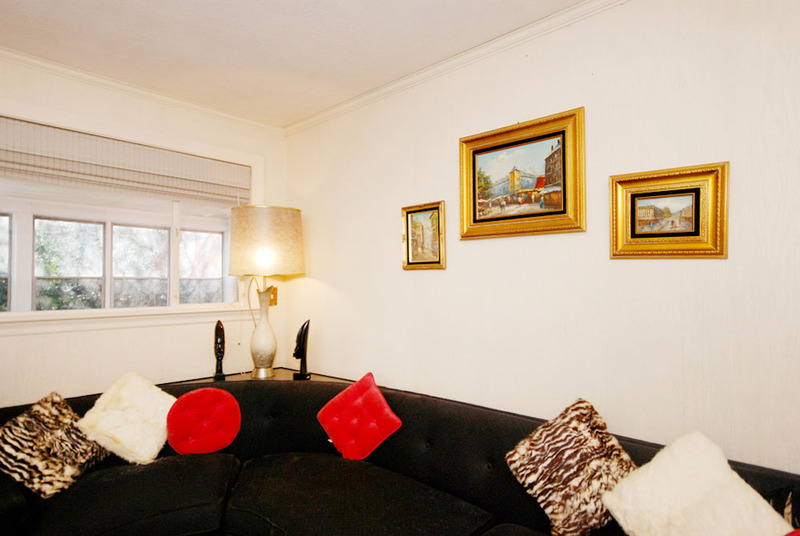 The upholstered … headboard, I guess we need to call it… is amazing! 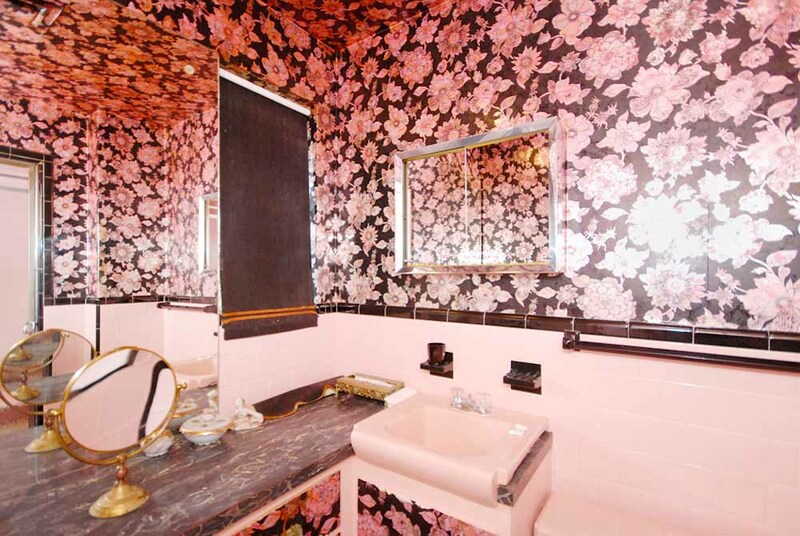 Above: Pink and black bathroom — with metallic wallpaper on the walls — and ceiling above. I also spy with my little eye, wallpaper on the base cabinet doors. Wicked crazy awesome! In the way downstairs of the split level (behind the garage part), the party is ready to start. 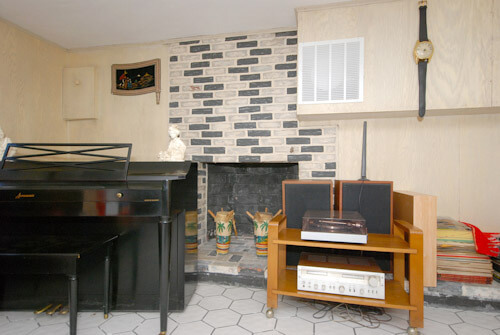 The fireplace is very peppy. Those wall clocks made to look like wristwatches are wonderful. 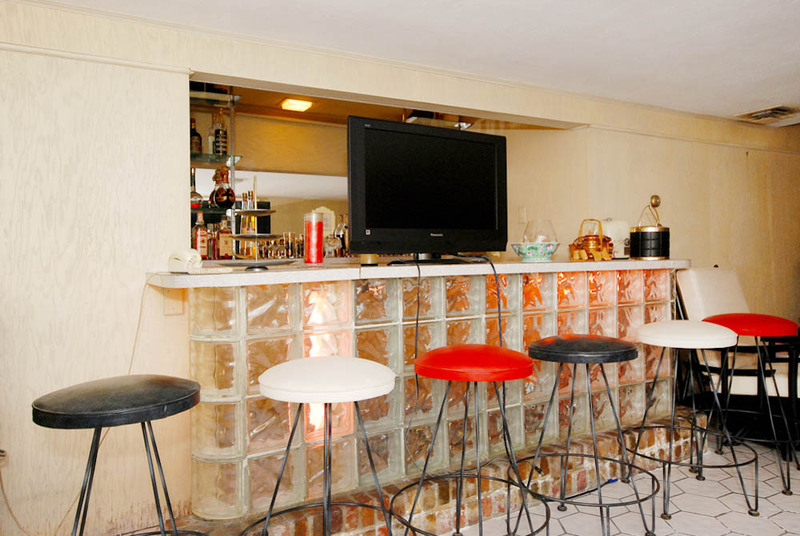 Above: This is a cool idea, a glass block bar, note how it’s set on two courses of bricks. 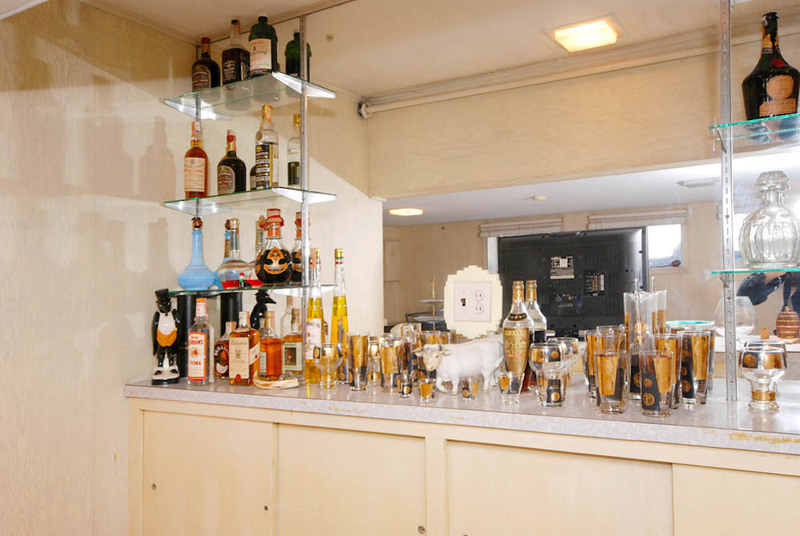 The back of the bar is mirrored — look closely, and you will see the mirror is three pieces. The pieces are set between Knape & Vogt (or KV style) modular shelving standards. This makes it easy to add glass shelves for the booze. What a terrific idea. 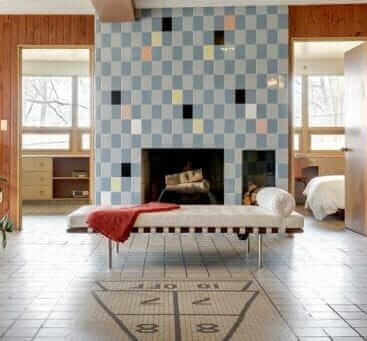 Is the entire a house a time capsule? 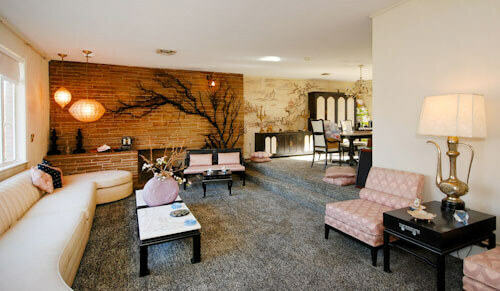 Or was some of it (at least) redecorated in the 1960s? 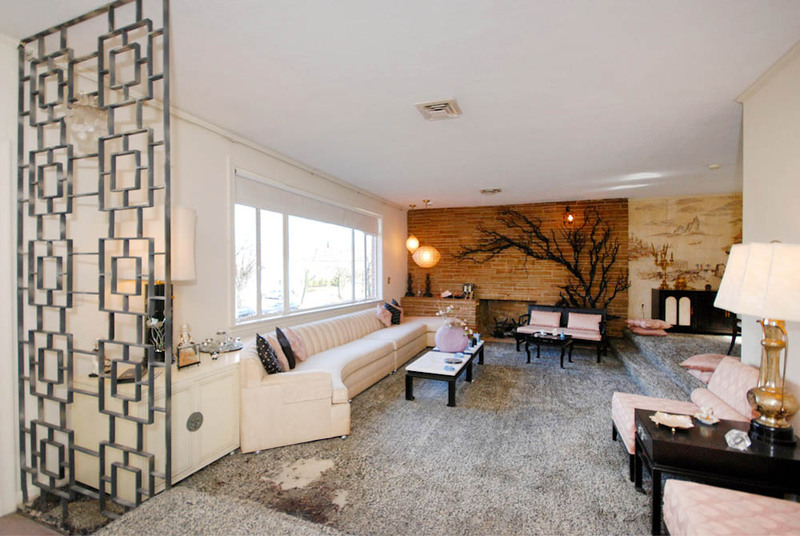 Want to buy this 1956 time capsule house? oh.my.god. this house is beyond beautiful. whoever gets to live here is the most lucky person. ever. 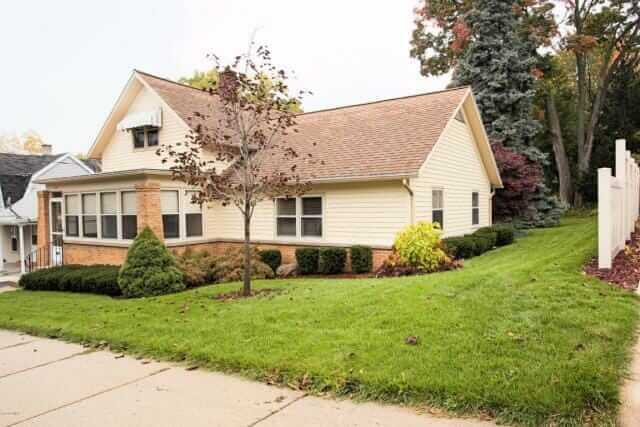 Hi everyone, I just want to let you know that we got our offer accepted for this house. 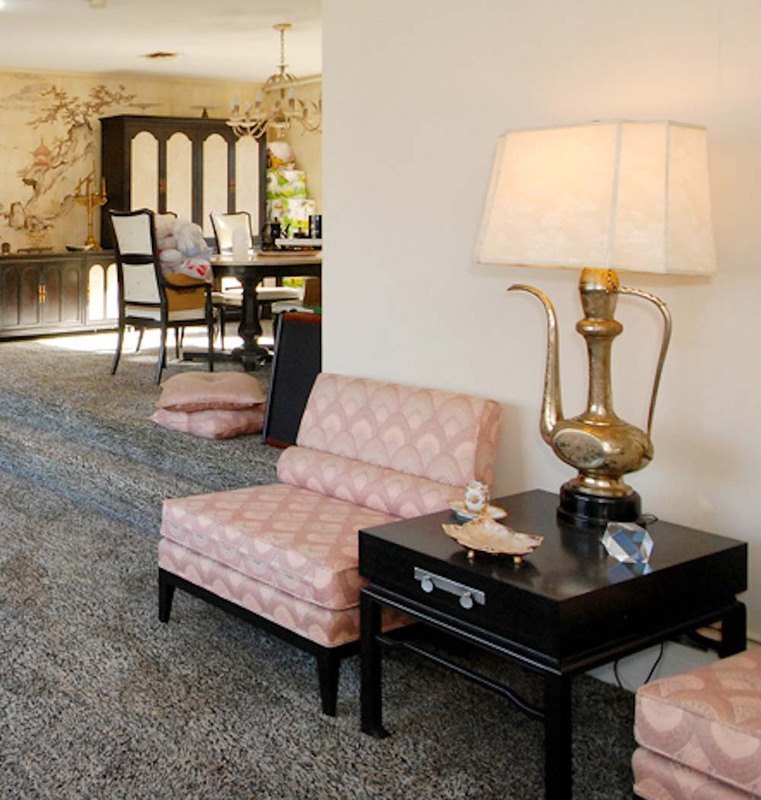 when I first walked into this house, my first impression was: GUT IT… after seeing your comments, my husband and I are going to preserve its integrity as much possible. How exciting! 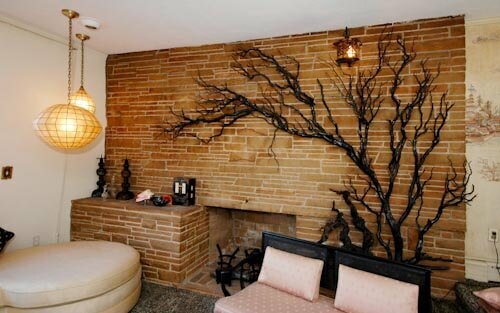 Both for your fabulous new house and that you will reconsider gutting it. Pam always says it is best to live in a place for a year before making any drastic changes…things that you thought you didn’t like when you moved in might just grow on you over time. It happened at my house — I’m glad I didn’t jump into anything too quickly — and waiting also let me see how we functionally use the house too. Please please please do not gut this lovely lady. And I hope you will share the freshening up touches you bring to it with us. Congratulations, Ginoos, and welcome to the Retro Renovation clan! Hi! We just bought a split level almost identical to this one (not a time capsule though!). 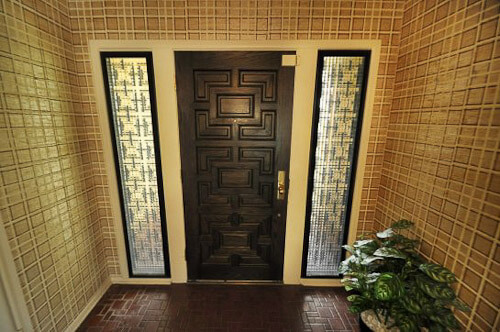 Do you have any idea where we might be able to get a room divider screen like they have between the front door and the living room? *disclosure: They’re an advertiser but I’d refer you to them even if they weren’t. Alternative: Keep an eagle eye out for vintage, especially at your Re-Store… but I’d guess these are rare(ish) to come out of houses intact. I see that Crestview have gone out of business- anyone else making similar?